"Just to let you know I returned to my car after an early cinema show (8 15pm) and found my car window smashed among all the cars parked on the street and only mine any damage. Some people passing loaned me their phone so I rang he Gestapo and a cop came, motor bike and took the details of a car parked illegally at a bus stop near by; he did not bother about my car. Dec 2005 and Daisy Mae Morrison's car was vandalised outside my house, we had gone into Lancaster. That was WITNESS INTIMIDATION and in Jan 2006 when she called again and her car was written off, I had my court case then stayed to protect my witnesses. In Dec 2008 they stole my car K71 CEC and installed a GPS, I found out and they stole my car taking it to the police garage MACADAMS where they systematically wrecked it to hide the GPS installed then illegally. The Gestapo have stalked all day trying to pretend they see me driven by another. I can drive my car back to Hell View and cover up the windows. They started on my car over a week ago. Carol (so someone knows) the street is terraced houses and someone must have heard it all. I also note that YOU arranged for my car windows to be smashed to be Daisy Mae's car at my house Dec 2005 and then Jan 2006 in WITNESS INTIMIDATION with the thugs then following me to a corner shop to threaten and intimidate me. The dreary old loser stalking me after the library about 5 45pm reminded me of those thugs that night Jan 2006.FOR THOSE CC THIS I HAD MY THEN COURT APPEAL STAYED TO PROTECT MY WITNESSES. DAISY MAE IS BLACK SO IT WAS AGGRAVATED BY RACISM AND HER CAR WAS WRITTEN OFF IN JAN 06 AS MINE WAS IN THE REPEAT OF JAN 2009 AFTER MY HOUSE HAD BEEN WRECKED OF COURSE WITH THE WINDOWS THERE RIPPED OUT IN THAT WRECKING OF MY HOUSE IN OCT 08 PRIOR TO MY CAR. I note that the Gestapo biker called after some people were kind enough to help me at my car and reported the TARGETED VANDALISM via their phone. The Gestapo was not calling about my reported car but to note a car illegally parked on a bus stop. EJ61 NPF and if you think that makes me forget the GMP thugs at my brother's house parked then at a bus stop in Nov 2004 to threaten and intimidate you can think again, bullying thugs. This to GMP thugs and so they know my photos of that night are excellent and WILL BE SEEN. HOW COME THE POLICE OFFICER DESCRIBED ABOVE DIDN'T EVEN RECORD THIS CRIME OF VANDALISM TO A CAR? WHAT'S GOING ON WITH LANCS. POLICE? It is truly scandalous that these stalkers are paid from the public purse - and there can only be one agency behind it all - because, for these thugs to be at the University where Carol Woods is, the tracking device must've given away her location, either en route to the location, or whilst she was there. SECTION OF A MESSAGE TO A [so called] TOP BARRISTER, 18 Dec. 2017: [there was no reply - so far. Interesting. This was the same barrister who told me this police force couldn't be prosecuted. I replied that I thought "noone was above the law"? How foolish we general public are to think all men are equal under the law when its not like that at all]. To summerise: if the actions of Lancs. police are “covert policing actions” as they have clearly stated in writing in a letter, then that action clearly contravenes the D.P. Act as the actions are not “fully transparent”, and have to be. By not telling any information, it is surely deemed "secretive", or covert", is it not? 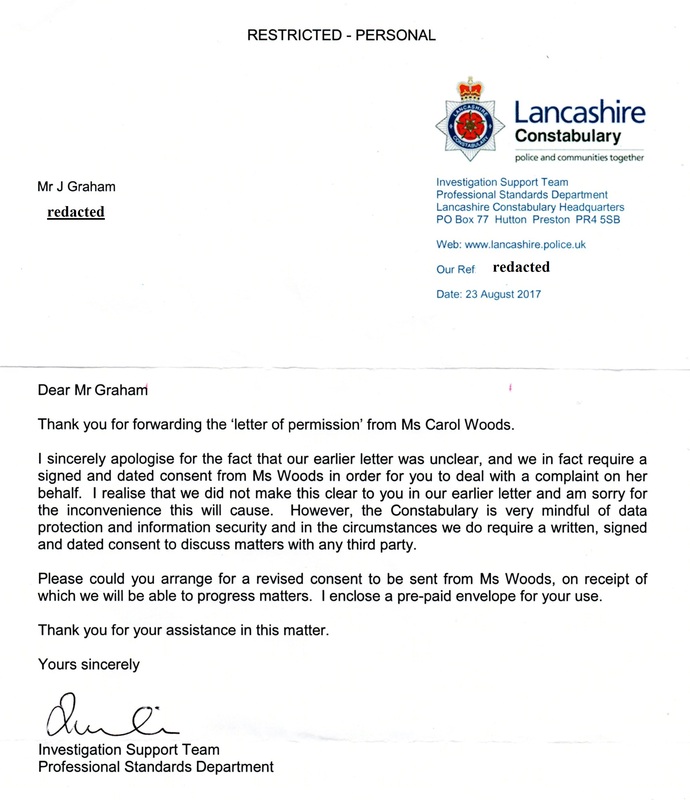 b] re: the 2nd line above, by the 2nd dot: "There is a contractual or legal obligation to process the data"– Ms. Woods has not been given any data pertaining to this device, "processed" or "unprocessed" and therefore the “legal obligation” by Lancs. police is broken, especially because the wording in the Act states: "Under this Act, persons who have tracking devices installed in the vehicles they own have the right to know what information is being held about them and the purpose for which it will be used". Please note that Ms. Woods has been told nothing about anything re: the device, and the device has been in her car much longer than when she made the SAR [FOIA] request and paid the fee at the force's Hutton HQ in Ja. 2017. Another clear irregularity where laws are broken. Lancs. police have stated in writing that this device falls under "covert policing actions" and as such do not tell anything regarding this device - what it's for, why it is there, or what information is gleaned by the device and what that info is used for - all these actions fall foul of the spirit of the Act and the Act itself - which surely makes the device totally not legal. Finally, the statement in the 3rd line and by the 3rd dot, referring presumably to 1] Ms. Woods being "the subject" = and the words: "It is necessary in order to protect the vital interests of the subject”: Ms. Woods is not protected in any way by having this device in her car, and BE IT KNOWN THAT THE DIRECT OPPOSITE IT TRUE AS THERE HAVE BEEN DIFFERENT ASSASSINATION ATTEMPTS UPON MS. WOODS BY STALKERS WHILST SHE HAS BEEN DRIVING HER CAR – THE EXACT OPPOSITE of a “protective” device, as clearly stated within the Act. Surely it is clear that Lancs. police's "policy" fails entirely to be not only "a policy that is fully transparent and compliant with the Data Protection Act", but that the Act has failed to be followed in so many areas. Despite at least 3 employees at the Home Office, and other government employees recommending in printed letters, including one from Mike Penning MP that I take any grievance regarding Lancs. 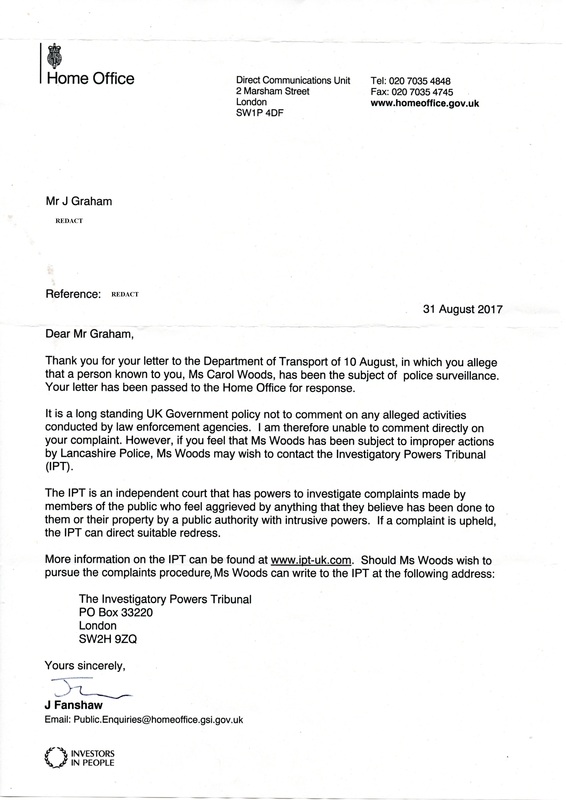 police's behaviour connected to Carol Woods to the Investigatory Powers Tribunal [IPT] I can now say that this outfit is doing nothing at all regarding my sending them 15 pages of notes and a wad of their forms regarding the illegal tracking device that was installed in Carol Wood's car by Lancs. police. Likewise the IPCC has also refused to act on complaints concerning Lancs. police's actions, and have stated in writing that anything sent will be referred to Lancs. police for conclusion! Not only that, a top barrister, whose name I won't mention here, has also advised that the CPS will not prosecute a police force, no matter what. There we have it. Also, the official F.O.I. Act [S.A.R.] fee was paid [and the receipt obtained] to Lancs. police at their Hutton, Preston HQ in January 2017 by Carol Woods for the proper and obligatory information relating to the GPS device in her car, THAT INFORMATION STILL BEING WITHELD BY LANCS. POLICE - another offence. See how the device entered Carol's car here, below, entitled: "Carol Woods statement of HOW THE TRACKING DEVICE CAME TO BE IN MS. CAROL WOODS MOTOR VEHICLE". "it is vital that organisations maintain a vehicle tracking policy that is fully transparent and compliant with the Data Protection Act. Under this Act, persons who have tracking devices installed in the vehicles they own have the right to know what information is being held about them and the purpose for which it will be used. For this reason, collecting data covertly is considered to be in breach of the law." To summerise: if the actions of Lancs. police are "covert policing actions" as they have clearly stated in writing in a letter, then that action clearly contravenes the D.P. Act as the actions are not "fully transparent", and have to be. re: the 3rd line, Ms. Woods is not protected in any way by having this device in her car, and therefore this device is not justified in any way. ALSO, BE IT KNOWN THAT THERE HAVE BEEN ASSASSINATION ATTEMPTS UPON MS. WOODS BY STALKERS WHILST SHE HAS BEEN DRIVING HER CAR - THE EXACT OPPOSITE of a "protective" device which is defined in line 3 above, according to the Act. All in all, this device breaches not on the Data Protection Act itself in many areas, but ALSO THE E.C.H.R., as already explained, that being the device breaches Ms. Woods privacy! Directly below, is the pointless and meaningless response received from Lancs. police, dated 17 November 2017. I say meaningless because this response doesn't actually address anything - but it does actually state the no investigation AT ALL has been undertaken regarding the complaint made about the GPS tracking device in Carol's car, only a response at "local resolution" level - a pointless exercise meaning, more than likely, that an extremely informal chat took place between certain "officers" over a cup of tea during a "tea break" in the police station canteen to resolve the extremely serious and longstanding complaint regarding the horrific and blatant targeting of a vulnerable, single, lawabiding old age pensioner who gave her entire life in service to others - particularly vulnerable and lone CHILDREN. Trying to get the right and proper conclusion to the abject and preplanned flouting of the law by these characters has taken so far 9 months, since March 2017, when my original communication [below] was sent to the then Chief Constable Finnegan, who then left his post and moved on! The latest interaction is hardly worth reporting, despite the misleading title of the team that has been sadly been corresponding for a minimum amount of time compared to the original date of beginning this complaint - MARCH 2017 - 9 MONTHS AGO. All that's happened is that nothing to do with any investigation or conclusion to anything has taken place, or even been remotely near, yet pointless paperwork like the below was sent, to presumably, keep me quiet, in,line, shut up and satisfied. I don't think so. Despite this contemptuous timewasting and subsequent squandering of our tax money [which funds the pointless nonsense of illegal tracking devices in totally lawabiding citizen's cars also] LANCS. POLICE ARE STILL GUILTY OF BREACHING NOT ONLY ARTICLE 8 OF THE E.C.H.R. BUT ALSO THE DATA PROTECTION ACT by not saying anything about it to the innocent recipient of the GPS device which it is their duty to do, and are guilty of probably A WHOLE LOT MORE regarding everything that we aren't even aware of, such as "unjustifable police actions" and the "rampant squandering of public funds" etc. etc..
What kind of police force is this that can persecute a lawabiding pensioner so badly for so long [since 2006]? For Lancs. police are responsible for a great deal of extremely questionable behaviour - for which there is OVERWHELMING and UNDENIABLE EVIDENCE. "Carol Woods statement of HOW THE TRACKING DEVICE CAME TO BE IN MS. CAROL WOODS MOTOR VEHICLE"
"hi, just got the mail - completely crazy at my return [Ms. Woods had been away on holiday...JG.] - preface my car was not at an airport car park - apparently I am the owner of a silver grey Yaris much newer than mine - I seem to be an Asian female with long, dark hair. I looked on Northern Car Sales site, Shaw Rd. Oldham January 2012 when staying with my sister - I only went onto the yard to get rid of a thug following me - he just used his phone presumably to say I looked at cars. I decided a car for sale was affordable and having a car would solve massive problems. I went back the next day and felt sure they expected me. Another car had appeared - the red Yaris and I was diverted to that. I had a test drive, liked it, agreed to buy it - cash. But the car price was £40 short of [my sister owed me money so I knew I'd get it] - the garage was responsible for completing the tear off strip for DVLA doc. change of owner / address of registered person. All that done, I had to go and get insurance before removing the car - I knew I'd have been arrested for driving without insurance if I drove it just to my sister's. The insurance matter was awful - I've had other cars and never experienced the antics but - all done the garage told me not to collect the car until 5pm on 21/1/12 - why? Surely they just wanted it off the yard as sold? contacted and told if they wanted to stay in business, they'ed do as told. Gestapo? Yes. Then he said "You're dealing with lunatics" - I said, "I know". I went to sit in the office - the DVLA slip I could see - the man in the office assured me he would send it on - I was using my sister;s address to register the car. He told me not to bother about the £40 which I'd said I'd drop in with on 22 Jan.
Getting the car about 5, I asked why there was no new key - he'd broken the original, old key, hadn't he? I also asked why they had not used the spare key and just had a 2nd as spare cut - they knew I knew exactly what had gone on. Oddly, the man said "They can't keep on arresting you" - "of course they can - who'll stop them?" I said - a bit more chat - I said I'd be in the next morning with £40, was told not to bother but I wasn't falling for that. It was a trap. Parking at my sister's then showing her the car - I saw 900 miles had been added to the clock from my agreeing to buy it. [I faxed the Home Saecretary and K Clarke at least 3 times each to get that on record - where the hell had I apparently been to use 900 miles?]. The next morning I went with the £40 - they were not open - or pretended - the £40 trap was set. I took a note of the 2 x £20 notes, scribbled a note, put in an envelope and took photos of it going imnto the letterbox. I owed them nothing. On the 23rd Jan. I drove to Lancaster and transferred my insurance to my company - one I'd used for over 20 years - they were really good and getting all the refund due to me, showed illegal accessing of the company systems. The Gestapo pulled me up after I left my insurance company [each event has it's own story] - just to harass - to be seen to be a liar - then I returned to my sister's. I left her house and stayed in a guest house for 4 days - called into the garage and they had NOT sent the DVLA doc. on. I asked for it and dealt with it myself. They had no intention of sending it in. For days then weeks then months [I started to rent at 298 on 4/3/12 after driving to Lewes to deal with outstanding matters from 2011 and living in my car most of Feb.] attempts were made to stealing my car key so I would then have to force my locks to get in and have new locks - their problem was they could not claim I had stolen the car, that I drove without insurance, and that I knew of the GPS - and how I could prove they had not broken the key at all to have a new ignition system fitted. With amazing luck, my car key was stolen but I had the spare key in my bag so didn't need to force the locks - had another spare cut and so it went on. Followed into the ladies in students union offices which are not open to all and sundry - at the Uni - washing my hands - my keys placed by the sink disappeared - reported - ignored. I knew it had to be 1 of 2 trolls - again, I'd had my spare in my bag and always keep a spare. 2 garages have looked [April '16 and May '16] to see if they can remove it but said "too sophisticated" and will disable the car if they try to remove it." N.B. 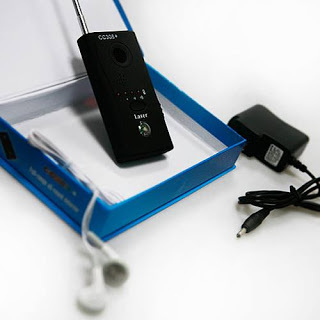 : Everything to do with this illegal GPS tracking device, including everything above was sent as a complaint to Lancs. 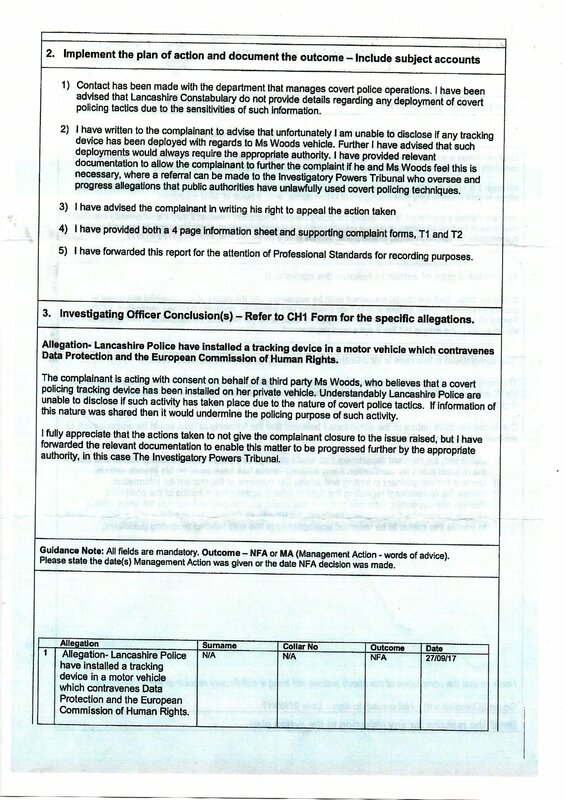 police, and their "Investigations Team"s response was - nothing, and thus everything was then forwarded to the Investigations Powers Tribunal [IPT] after filling in all their forms, and sending 15 pages or so of documents pertaining to the device and related items, including Lancs. police's so-called "responses" - the IPT's response has also been - nothing. 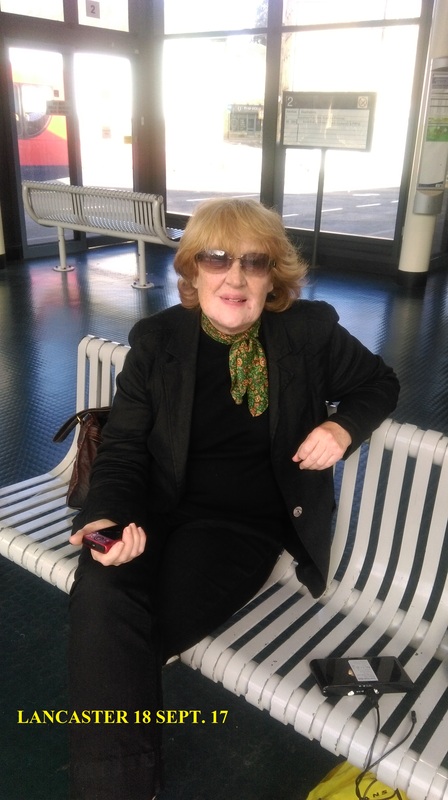 The woman I spoke to weeks ago at the IPT when chasing up my sending of the IPT forms and related docs. notifying the IPT about this GPS device even told me the IPT tribunal would probably dismiss my contacting them regarding this matter of this illegal GPS device, or deem everything inadmissable - and this was the receptionist on the phone one gets when initially calling in to the! To date, 12 Dec. 17, I am still waiting to hear from the IPT regarding anything to do with the 15 pages of notes and forms sent to them - completely unaccptable! Regarding the illegal "tracking device" installed in Carol Wood's motor vehicle, and despite CW's asking for obligatory information from Lancs. police regarding this device after her paying the proper "Freedom of Information" request fee at Lancs. police Hutton HQ in January 2017 was totally ignored, Lancs. police wanted a letter of permission, finally, from CW so I could interact with Lancs. police on her behalf so my complaint regarding this "tracking device" being installed in Carol Woods motor vehicle [and other matters] could be taken seriously. One original contact with Lancs. police was in March 2017 [below] to the chief constable Finnegan, who promptly moved on from his postition - my communication completely ignored, as was every other communication sent until I contacted 3 chief constables a couple of months later regarding not being able to report serious crime to the police, which was also ignored by all sent to, so then I had no choice but to begin complaining about that. The "Investigations Support Team" of Lancs. 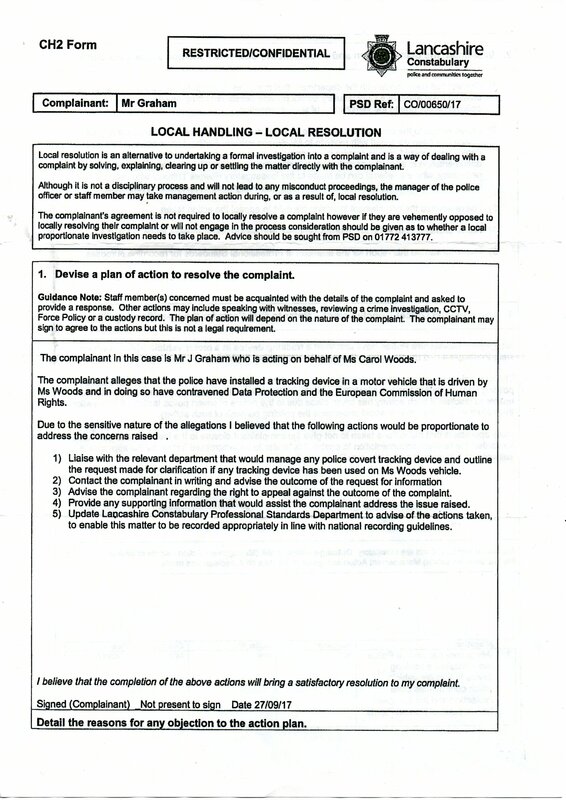 police answered finally, [below] requiring a "letter of permission" from Carol Woods so as I could interact on her behalf regarding matters, also below. 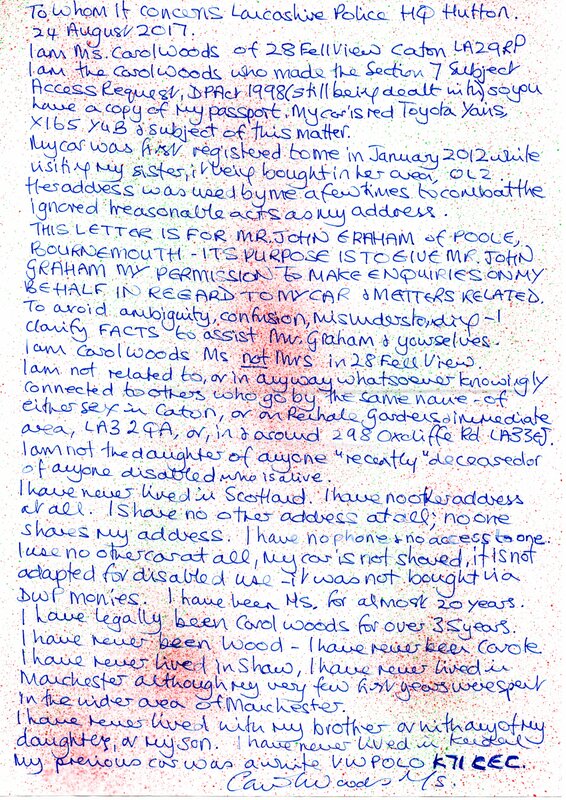 Now, after that "letter of permission" was finally received in writing from CW, and sent to Lancs. police, still nothing is done by Lancs. police Professional Standards and "Investigations Team" about this "tracking device"! Below, the original [ignored] communication from 31 March 2017 to the then Lancs. police chief constable Finnegan regarding the illegal GPS tracking device in Carol's car. All other communications regarding this subject and reporting serious crime are ignored by all police contacted - including my local police, and 3 chief constables, until finally 2 local officers visited myself unexpectedly [after I had written so many times to the Dorset CC trying to make contact with police] on Saturday 9 June 17 at 9pm claiming - after my explaining as best I could the utter chaos Carol is forced to suffer courtesy of the authorities in Lancs., - that they would report matters concerning Carol Woods to Lancs. police, and Carol would be contacted by Lancs. police forthwith. Of course no such contact has been made by Lancs. police to Carol as promised - the daily persecution continues unabated, though. "The UK vehicle tracker laws fall under the category of processing personal data and accordingly, it is governed by the Data Protection Act 1988. In order to ensure vehicle tracking legality, it is vital that organisations maintain a vehicle tracking policy that is fully transparent and compliant with the Data Protection Act. Under this Act, persons who have tracking devices installed in the vehicles they own have the right to know what information is being held about them and the purpose for which it will be used. For this reason, collecting data covertly is considered to be in breach of the law. 2] The European Court of Human Rights "Article 8 of the European Convention on Human Rights provides a right to respect for one's "private and family life, his home and his correspondence"
data.protection@lancashire.pnn.police.uk Jan this year, it was acknowledged as received as I drove all the way to HUTTON HQ, to deliver it (I asked them to formally acknowledge receipt) as well as getting a receipt there at the front desk". Therefore Ms. Woods has applied for the information regarding the tracking device in her vehicle, but not received any information in return - an extremely serious irregularity. Can you please remove this device from Ms. Woods motor vehicle that is clearly falling foul of the statutes in place - those being the Data Protection Act 1998 and the Article 8 of the European Commission of Human Rights? After much stalling by the Lancs. police to even admit there was a tracking device in Ms. Woods car this letter below was finally received on the 27 September 17 from Lancs, police "Investigations Team" with the admission that a tracking device was being used in Carol's car and was being used under "covert policing tactics", which is quite a remarkable example of bs considering known jihadi terrorists in the UK surely are not stalked as severely, nor are organised criminal gang members. Carol is neither of those, and it is painfully obvious that the only reason the device is being used at all is to blatantly harass and gangstalk Carol every time she goes out and drives her car. Indeed, attempts to murder Carol have taken place when she has been driving her car, when the unemployed stalking yobs who harass Carol all the time anyway have tried a few times to manufacture road traffic accidents where Carol would be the injured - or deceased - party. I myself witnessed - as a passenger in Carol's car when I visited earlier this year - these stalking yobs driving their car perilously close to Carol's completely unneccessarily, and performing outrageous manoevres with the passengers in the offending car looking back, once passed, laughing hysterically at their perverse actions. Again, Lancs. police have much to answer for by paying these thugs to perform such cr-p, deliberately endangering lives in the process. "COVERT POLICING TACTICS" ARE CITED IN THE LETTER BELOW FROM LANCS. POLICE AS THE REASON this GPS device has been installed in Carol's car - BUT WHY? Carol is no "JIHADI TERRORIST", nor a member of any ORGANISED CRIME CARTEL, or anything to do with anything CRIMINAL, yet Lancs. police have installed this GPS tracking device in her car and WON'T TELL HER WHY!! WHYEVER NOT?? Not only does this GPS device breach Carol's HUMAN RIGHTS [Article 8 of the E.C.H.R.] but by not telling Carol why the device is there in the first place also breaches Carol's rights under the DATA PROTECTION ACT. She has paid the correct fee at the Lancs. police Hutton HQ in January 2017 via a FREEDOM OF INFORMATION ACT REQUEST [S.A.R.] that is the normal procedure to get the information but still Lancs. police refuse to forward any to her - ANOTHER CRIME!! Please note that all complaints made to the IPCC by law must be forwarded to the 'appropriate authority' for consideration - usually this is the Professional Standards Department (PSD) of the police force concerned. When you submit your complaint in full your details will be passed onto the PSD for consideration. ​specifically the one shown below dated 31 March 17, and against also their Professional Standards, who are mentioned in the attached response ​[letter] from Lancs police - they still have not contacted me as promised. The above communication was replied to in full by the IPCC - the end result simply stating that everything was passed back to Lancs. 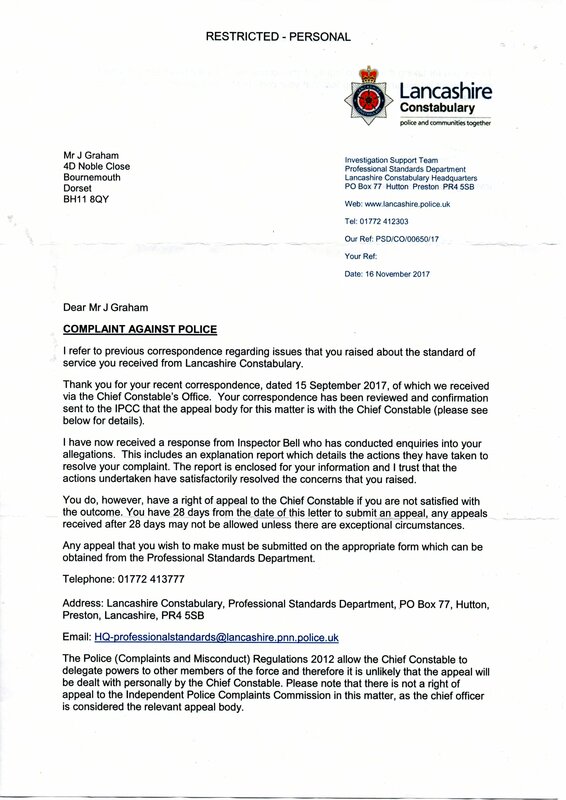 police by the IPCC - hence the Lancs Police "Investigations Team" finally responding via their "covert police tactics" letter on the 27 September 2017. The next stage was complaining to the IPT, which was done, but has got nowhere as I write on 12 Dec. 17. - the entire process beginning in March 2017 with the letter to the ex-CC Finnegan. The above are just part of numerous communications to and from UK government departments regarding the appalling and illegal targeting of Carol Woods by certain UK government personnel paid by the taxpayer to act in a responsible and honest manner, which include, especially, the police - local to Ms. Woods and the main force, and the county council, and all connected, including Royal Mail, who refuse to do anything regarding Carol's mail being deliberately diverted and misdelivered, or delivered to her months later - or not delivered at all.